Family, Crowfoot. Color, white. Leaves, opposite, divided, generally, into 3 leaflets, each deeply serrate, more or less heart-shape at base, smooth, dark green. Petals, none. Sepals, 4, small, looking like white petals. Pistils and stamens, in different flowers, numerous, a few sterile stamens often mixed with the pistils. 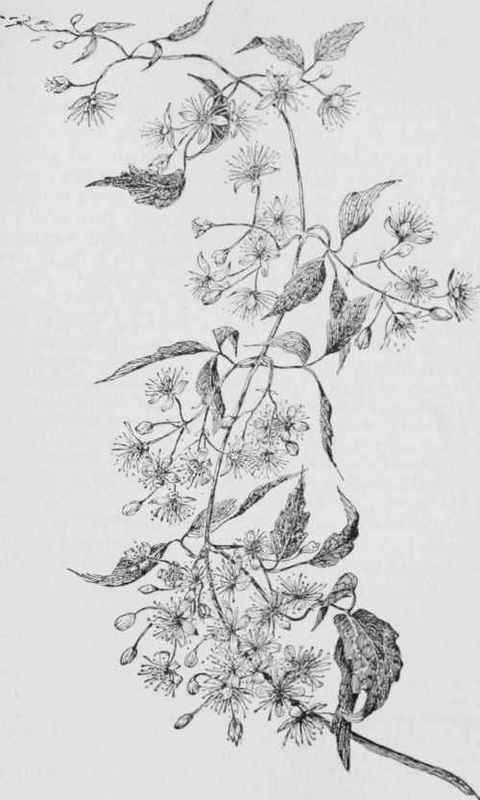 Flowers, in leafy panicles. In the center of the fertile flower the fruits ripen into plumose achenes, feathery and downy, enabling the seed to float far in the breeze. July and August.